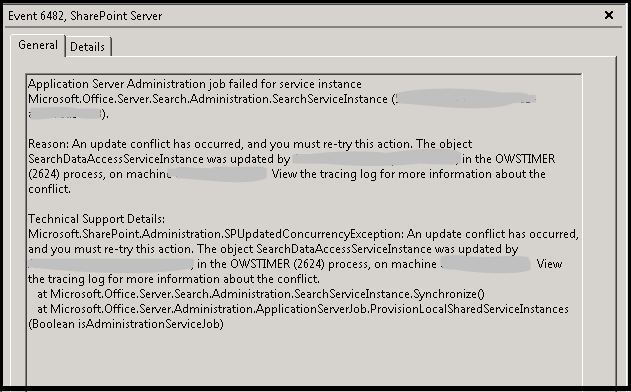 Application Server Administration job failed for service instance Microsoft.Office.Server.Search.Administration.SearchServiceInstance (GUID) – Event 6482, SharePoint Server is popping up in the server running Search service once every minute. Search is working fine without any issues, Content sources are crawled, indexes are created normally. No issue on user side of things.But the above error is flooding the event logs. Initially, we are under an impression that the index files are corrupted on this server. Before messing up with search topology, based on some suggestions in forums, we tried clearing up the configuration cache on front end servers. That suggestion was right on point! The contents of the file system cache on front end servers is newer than the contents of the configuration database. Clearing and resetting the counter on cache fixed the issue. Clearing the configuration cache on front end servers. Here are the instruction on how to Clear configuration cache in SharePoint farm.